The cinema of Terence Davies seems to be having a tiny renaissance right now, as the release of his new film, the documentary/tone poem Of Time and the City, coincides with a short retrospective of his work at New York’s Museum of Modern Art. Of course, anyone who has followed, with frustration, Davies’ career knows that this comes as small consolation, both to his fans and surely to the director himself, if at all. Widely, and rightly, regarded as one of the world’s greatest living filmmakers, Davies has struggled to get films made for over four decades, primarily for money reasons. One could say that, considering his films’ often anti-narrative and highly personal natures, this isn’t much of a surprise, but it speaks more to the film industry apparatus in England than it does to the rejection of true art cinema around the world—after all, “difficult” filmmakers given to abstract expression, such as Apichatpong Weerasethakul, Tsai Ming-liang, and Abbas Kiarostami, have been able to finance projects for years with state subsidizing. It was only a matter of time before the creator of such visually and emotionally shattering works of memory as The Trilogy (his first venture into cinema, consisting of three short works of pseudo-autobiography), Distant Voices/Still Lives (the best British film of the 1980s), and The Long Day Closes (the “sequel” and equal of the prior), with their painful self-revelation, would turn to nonfiction filmmaking. And naturally Davies’s first foray into documentary doesn’t come without its radical narrative adjustments. Yet this project sprang even more from necessity than a desire to once again delve into the past—or maybe it was serendipity. 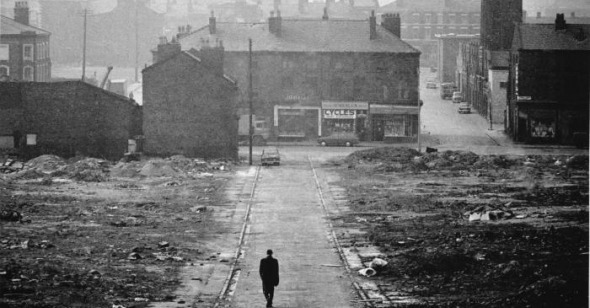 Of Time and the City, a gorgeous love-hate reminiscence of Davies’s hometown of Liverpool, came about because Davies was awarded 250,000 euros for a digital filmmaking initiative brought about by such cultural institutions as the BBC and the Liverpool Culture Company. Thus Of Time and the City is budget filmmaking, and though it’s assembled mostly from archival scraps, it’s gloriously, wholly Davies’s own, a rich summation of its maker’s fears, desires, and shames, as well as a (according to some recent interviews, possibly final) testament to his old stomping grounds. From its hushed opening moments, it’s apparent that we’re not about to witness a generic, talking-heads documentary, or even a detached ethnography of Liverpool. To a wistful Liszt sonata, a red curtain, glowing out of an immense, theatrical darkness, slowly rises and parts. Behind it, the image on the screen fades in and out, like memory itself. What proceeds is not unlike Hiroshi Teshigahara’s superlative Antonio Gaudi, if not as radically formalized: Davies has created a film not only about a personal and shared past, but also about architecture—how we interact with it, how it defines landscape, character, and national and local identity. When he begins his journey, in 1945, we see locales familiar from many a Liverpudlian reminiscence: smoking chimneys on rooftops, row houses compressed together along desperate, inclined streets, filthy kids playing in narrow alleys, women in aprons laboring over laundry and other chores. Yet the immediate postwar environs soon give way to dubious, cheap modernization, and Davies pointedly turns to the dismal concrete slabs of municipal tenements encroaching the horizon. The filmmaker increasingly becomes an “alien in my own land,” and during this outpouring of ashen images of working-class folks intimidated, even swallowed, by their surroundings, he often remains wordless, brilliantly employing Mahler and Peggy Lee (with Jerome Kern’s “The Folks Who Live on the Hill”) to do the editorializing. This is not to say that Davies isn’t without his retorts. In fact, his narration, rasped out in a bitter, erudite near-whisper, is what turns some people off from Of Time and the City, so dotted is it with quick, curmudgeony jabs at those things that have evidently pestered him for years. Yet even though Davies here betrays his own anachronistic classicism, his guileless strikes at such personal targets as the Beatles and poor contemporary sportsmanship (they once knew “never to punch the air in victory,” he snorts) only serve to make Davies even more of a tragically, appealingly out-of-time figure, one ensconced in not just his own past but also a lost cultural past (Joyce, Chekhov, Dirk Bogarde, Mahler, Minnelli, ballroom dancing, Oscar Hammerstein II).